...And provide for those who grieve in Zion, to bestow on them a crown of beauty instead of ashes, the oil of joy instead of mourning, and a garment of praise instead of a spirit of despair. They will be called oaks of righteousness, a planting of the Lord for a display of His splendor. I could not fall asleep. I wanted to, so badly I wanted to. To escape this reality. To dream dreams where I was happy again. To feel, just for a moment, like I could breath again. I regretted so much not asking the doctor for something to help me sleep, after that awful, long, exhausting day when we found out Lily had died. I remember lying awake in my bed, writing my sister emails on my phone, telling her how much I wished she was here. I just laid there, crying silently, for hours upon hours, until light started peeking through my window. I remember lying very still, very, very still, with my hands on my belly. She was in there. She was in there, but she was gone. She had died. I had no idea why, and it was driving me crazy. It is something no woman should ever have to experience, the feeling of a child inside you that you knew was no longer alive. It does things to your mind, to your heart, things that are irreparable, permanent, devastating. I must be broken, I thought. The first miscarriage had been a fluke, they told me, but for Lily to die this far along, now it was definitely my fault. Why did my babies keep dying? What was wrong with me? Had I eaten something bad? Had I jolted her somehow? My mind went absolutely everywhere, into very, very dark places. How could it not? I carried within me the corpse of the child I loved. There was nowhere to go but dark. The darkness surrounded my mind, surrounded my heart. I felt ashamed. I felt so ashamed that this had happened again. I felt guilty for about a million reasons...for losing another baby, for causing my family pain, for ruining Lisa's trip, for being such a bad mother that my babies were dying one after another. I was mad at God, but mad does not even begin to describe the anger in my heart. 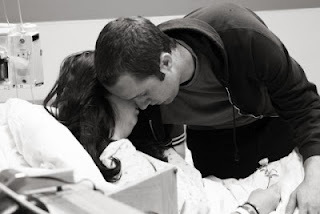 I was scared, but scared was something you felt when you thought something bad might happen...no...I knew I would face delivering a stillborn...I was terrified to my very core. I was sad, but sad does not even begin to scratch the surface of what I was feeling...what was this feeling sad did not describe? Broken hearted? Devastated? No. That did not describe it right. I was confused. So confused. Why? Why not earlier before we had told the kids? Why, after so many healthy ultrasounds? Why couldn't it have happened earlier, before I got so comfortable and had finally let my guard down and gotten excited over this baby girl? Why did it happen when Lisa was so far away? When Josh's sister and her husband were also on the other side of the world, oblivious to what was going on at home? Why did it happen at all? What was God doing to me? What was He trying to tell me? So many questions, no answers at all. I worried so much over what people must be thinking. I was convinced they were thinking "Well, she should have been happy with her two kids. This is what happens when people aren't content." They must all be thinking I deserved this. I was so embarrassed. I was so ashamed that we were, yet again, the center of everyone else's pity. I just wanted to grow our family like everyone else seemed to do so easily. I worried that people thought this baby was a selfish desire created because I wasn't content. I felt the urge to defend myself against imaginary disapproval. I was content! I was so content that I wanted another child to experience what a joy it was to be a part of our family. I felt I had more to offer another child, and I wanted this little girl more than words can say. Did people know that? What was everyone thinking? Did they think it was my fault? Did they blame me the way I was blaming myself? I have always struggled with what other people thought. This situation was no exception. You think Satan will leave you alone just because it is your darkest hour? You think he will cut you a break and not torment you with all your usual insecurities and fears just because you are experiencing the greatest tragedy of your life? Think again. He is an opportunist, and grief is a great opportunity to break someone down. My thoughts were all over the place. It was a chaotic attempt to make sense of something incomprehensible. As I listened to Josh sleep, his arms around me, around my belly, I didn't dare move. I remember praying that he wouldn't wake up for a long time, because once he did, he'd have to come back to this world where I was. As he slept, I knew there was relief for him. And I knew the feeling of waking up to a reality you wished was a nightmare. I didn't dare move and bring him back to it, back to the stabbing pain and emptiness. So I was still. I didn't move. And neither did Lily. And suddenly I was so incredibly aware of her stillness. The morning was a welcome relief. We had an appointment at the doctor to start the induction process. It was Friday. I remember waiting in the waiting room with Josh. He held my hand. I made no eye contact. Not with anyone. When I spoke to the receptionist, she whispered to me. I remember feeling as if everyone around me thought they might break me if they spoke too loud or made any sudden movements. They were probably right. I remember going into the little room with Josh. I had become extremely attached to him in the last 24 hours. I could not let him out of my sight, I could not even disconnect from his hand long enough to use the bathroom without going into a panic. I remember the doctor coming in and crying with us. She explained the process, and I was so dismayed at how long she said it would take. I expected to give birth to Lily that night, to be induced immediately and deliver her easily. She was so small, how long could it possibly take? How painful could it possibly be? I should have known better. She told me the regular methods of inducing labor didn't work as well when the baby was this young. They had to go about it differently, slowly. Your body just doesn't accept the fact that it is time to let go of the baby, and it fights tooth and nail to keep it safe. I remember thinking it was so ironic that my body was fighting so hard to keep the little life inside me, but didn't recognize there was no life left in it. I felt betrayed by my body, by my doctor who had promised me this baby was fine only a week before, by the baby who didn't stay alive. I was such a mess. I will not go into the details of what they do to start the induction process in cases like these, but it was pretty much barbaric in my opinion. It was the most physically painful thing I have ever experienced, and I gave birth to seven pound twins with an ineffective epidural, if that puts it into perspective. It felt like torture. I stared at the ceiling while the doctor did what she needed to do, and I sobbed. I sobbed at the absolute unfairness of what was happening to me. I squeezed Josh's hand and listened to him whisper comfort into my ear and felt his tears fall into my hair while he did his best not to fall apart. I nearly broke in half, and while I used every ounce of my strength to hold myself together, I yelled at God in my heart. I told Him He was cruel, I told Him I hated Him for doing this to me, I told Him I would never, ever forgive Him for the pain I was feeling both physically and emotionally. When it was over, I sat up and listened to the doctor tell me she would see me at the end of the day to do it all over again. And then I demanded drugs. Josh had to half carry me to the car, and right before I stepped into the parking lot, my body couldn't take it anymore. There was no room left for anything else, any more pain or hurt or suffering. I threw up all over the sidewalk. I don't remember that day much, just bits and pieces. I remember going to Sonic. Refusing to get out of the car out of fear someone would comment on my pregnancy. I remember a friend coming over and dropping off things I would need for the hospital. I remember lots and lots of flowers. So many flowers arrived, and I was suddenly so happy we had named her Lily. Lilies were all over the house, and it was comforting to me. I had to go to the hospital for a different doctor to do my amniocentesis procedure. This, I was deathly afraid of. I knew it entailed an ultrasound and a very, very big needle straight into the uterus to gather amniotic fluid for them to test. Every aspect of that sounded awful to me. I dreaded it. I remember the nurse taking me back into the procedure room and hugging me. I had never met her, and right there, I sobbed in her arms. She cried with me and told me how incredibly sorry she was. She treated me like a delicate glass object, so gentle and caring. She helped me undress and explained everything she was doing. The manager of nursing for the entire department came into the room and introduced herself. She told me through tears how sad she was for me, and that if it was okay, she was going to stay during the procedure and rub my feet. She wanted to rub my feet and cry with me. The nurse manager. I was blown away, and so grateful. The doctor who had done my ultrasound the day before came in. I hated seeing him, but he was so kind that I couldn't hate him for long. He explained the procedure to us, told us he was hopeful we would get some answers, and then began. He started the ultrasound, and five of us (the doctor, Josh, me, the nurse, and my foot rubber) all stared at the screen. My poor Lily. I remember saying, "My poor baby, look at my poor baby" over and over again through my tears. The nurses cried. One of them said her legs were so long and pretty. We agreed. The doctor took the biggest needle I have ever seen and stuck it deep into my belly, and I was so afraid he was going to poke Lily with it. It hurt, but not as bad as I thought it would. He pulled out a bunch of fluid, and I remember gasping when I saw it looked like pure blood. He told me it meant Lily had probably passed at least a week ago, and I cried some more. It was such an awful, sad, peaceful experience in that dark room with strangers who were doing their best to hold us together. We had to be at the hospital by four o'clock in the morning on Saturday. We sent the kids to stay with Josh's parents, and went in for my last appointment with the doctor late Friday afternoon. I had taken something to take a bit of the edge off, and Josh and I prayed fiercely in the car that God would not let it be as bad as that morning. I let Josh pray, because my heart just wasn't in it. I was having a very hard time trusting the Lord after it seemed my fervent prayers for Lily's health for the past five months had gone completely unheard. What was the point? Why ask Him for anything at all if He obviously wasn't listening to me? Deep down, I knew God had bigger plans than I did, and I knew He was in control, but that's why it was so hard for me to deal with. I knew my God was in control, and He still let this happen. How could I trust Him? That appointment was awful, but not nearly as bad as the morning. Josh and I left with plans to be at the hospital before the sun came up to deliver Lily. We had asked if we would be able to see her, to hold her, to take pictures. The doctor said that from the ultrasound, she looked "physically whole" so there was no reason she could see that we wouldn't be able to have time with her. She explained how Lily would look, how tiny she would be. Jake and Eisley had been begging, begging us to come to the hospital and see Lily after she was born. That's all they had been talking about since we told them we were pregnant, and it hadn't changed after they learned she died. They still, so badly, wanted to see her, wanted to hold her. After knowing what she would probably look like, though, we decided against it. They still tell me they are mad at me for not letting them come, but I don't regret it. She was scary for me to look at, and she was my daughter. I didn't want the only memories they had of their baby sister to be scary ones. I remember kissing the kids goodbye and telling them we would see them at the hospital tomorrow, before I had Lily. I remember the door closing after they left and absolutely breaking down into a mess of tears. I remember Josh holding me. I remember how I felt bonded to him in a way I had not felt in the ten years we had been together. We had experienced the kind of grief that made us outsiders to the world now. We saw it differently. We had been changed in a way that only we understood. We didn't even have to talk, we just knew what the other needed at any given moment. I remember watching the Food Network for hours, because it was the only safe thing we could watch. There was no chance of seeing a baby, a pregnant woman, or any kind of plot that would hurl us back into our reality. We just needed to pass the time and do it numbly. I remember how Josh would cater to my every wish and need in such a gentle and loving way. I remember how loved I felt by him, and I remember thanking the Lord that He was using this to bond us together, when it so easily could have torn us apart for good. And God held us both. I remember Josh telling me I needed to go to bed. We went there silently, dreading the morning. I remember laying there with him, talking and talking and talking. We talked about the kids, all of them. We talked about the delivery. We talked about everything and nothing. And we held each other, and we cried. We slept for maybe an hour before the alarm went off. I remember very clearly that I wanted to look nice. I wanted to look nice because Lily was going to see me. I remember how silly that felt, but I still took an hour to shower, to curl my hair, to do my make up. Josh told me how pretty I looked, and that we should take one last picture of the two of us together. 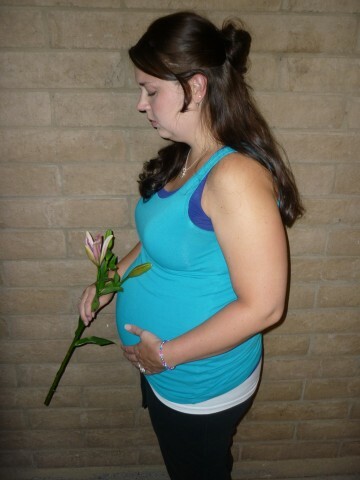 We had been taking belly pictures every month since we found out about Lily, and this would be our last. I grabbed a lily from the vase on the table, and took it outside. As we drove to the hospital, we listed to a CJ Bergmen song, "The Real Me". It was like he was singing about us. And we cried the whole way there. Through our pain, our anger, our hurt, our confusion, our bitterness, our sorrow...He held us every single moment. There was never, not one time, where I felt the Lord had turned His back on me. I knew He was letting me grieve how I needed to grieve. And I knew He was right there, ready to comfort me at every turn. And He did. And on that day, though I wasn't yet ready to face it, I knew the Lord was doing something bigger. That He would create purpose from this tragedy. I did not know what, or when, and I still don't fully know, but I trusted that part of Him. We prayed, even in those moments, that He would not let Lily's short existence be wasted, that He would do something with it so much bigger than us.We had not come to grips with her loss or the reasons behind it by any means, but we felt at peace that, eventually, we would.